Holding the charming city of Stirling – the site of the battle, 40 miles northwest of Edinburgh – became important to the Scots. Although created a city only in 2002 as part of Queen Elizabeth’s Golden Jubilee, Stirling has for centuries played an important role in Scotland’s often turbulent history, and many of its historic sites and monuments – such as the imposing Stirling Castle and the national monument to William ‘Braveheart’ Wallace – bear witness. Stirling lies on the River Forth and acts as the gateway to Loch Lomond and the Trossachs and belies its age through a vibrancy born of it being a University city. It boasts two theatres, excellent hotels and restaurants, and great shopping. For sports fans, the surrounding area offers no less than seven Scottish League football clubs. But the Castle remains this city’s sterling attraction. You could spend your entire time here exploring the fortress, discovering just how important it has been to the country’s history, and more especially, its long connection with Royalty. 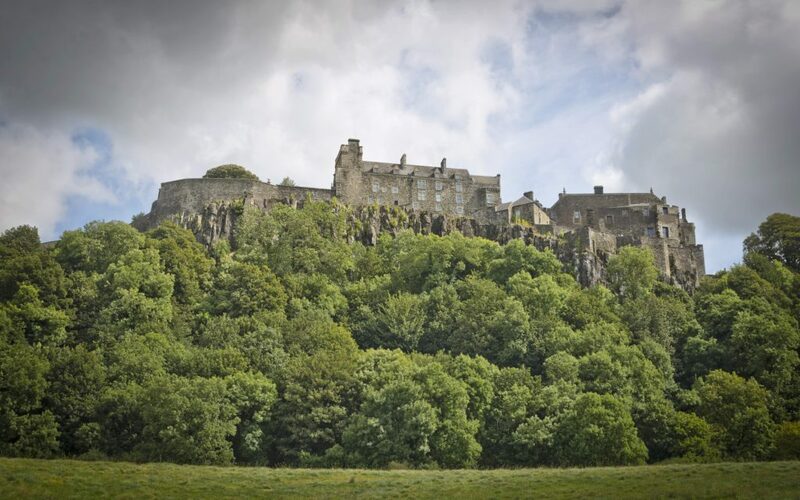 The Castle is built on a volcanic crag that dominates Stirling, and the site was almost certainly fortified from ancient times, though its importance as a Royal residence peaked in the 16th century. 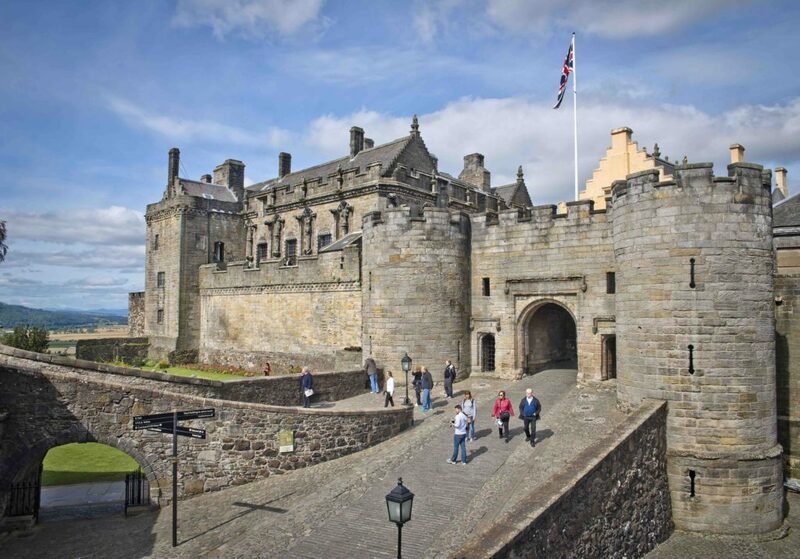 In its heyday, knights, nobles and foreign ambassadors flocked to Stirling Castle to revel in its grandeur and to enjoy its superb sculptures and beautiful gardens. Today, following a major programme of research and refurbishment, the Castle interiors have been restored to how they might have looked when used by Scotland’s Stewart Kings and Queens. It’s a venue very much geared towards the young visitor, as well. The Castle guides are funny and informative, and even the ghosts you will undoubtedly meet are usually pretty young ladies. Costumed characters in the roles of bodyguards, court officials, maids of honour and servants are on hand to introduce you to Court life in the 16th century. Even better for the kiddies, there is plenty of fun on offer in the vaults: they can dress in period costume, try their musical skills on medieval instruments, and paint. By the way, if you have never believed in unicorns, then you’re in the wrong place. Stirling Castle absolutely loves the horned horses of legend, for they are widely depicted throughout most of the rooms. There’s even a Unicorn Cafe. Round out a visit with a tour of the Castle’s museum of the Argyll and Sutherland Highlanders. Three gift shops nestled around Stirling’s grounds ensure there’s little risk of departing empty-handed. The Great Hall at Stirling Castle. VisitScotland / Kenny Lam, all rights reserved. On the walk up to the Castle, through the quaint Old Town, you pass Scotland’s most complete 17th century aristocratic townhouse. 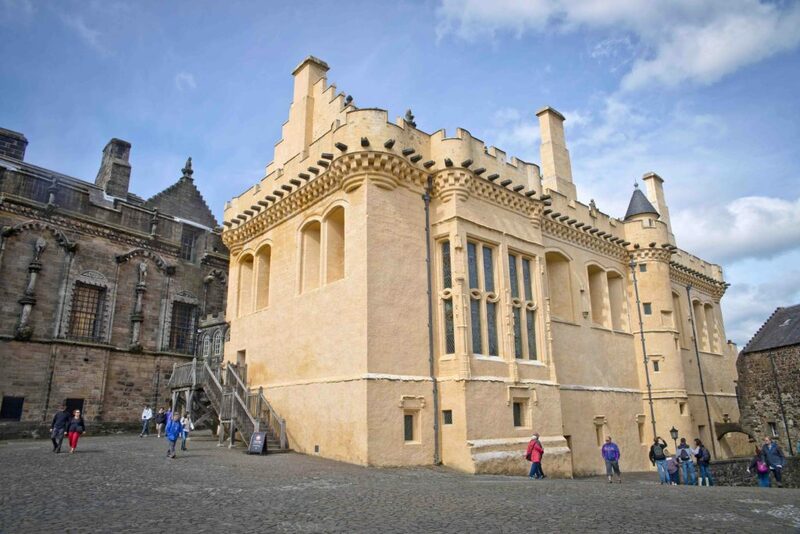 Argyll’s Lodging, begun in the mid-1500s but not completed until the 1670s, has been restored to display the luxurious world of the 9th Earl of Argyll, Archibald Campbell, and his Countess, Anna Mackenzie of Balcarres…and how the nobility lived! The walk also reveals the ruins of another once great residence, Mar’s Wark, built by the prominent Courtier, John Erskine. Just steps away lies The Church of the Holy Rude (Holy Cross), second only to the Castle in age (dating from 1129) and one of only three British churches that have hosted coronations. It is the medieval Parish Church of Stirling. Film fans will, of course, want to visit the National Monument to Scottish hero William Wallace who defeated the English at the Battle of Stirling Bridge and was then betrayed, captured and murdered. OK, so the Mel Gibson film was a tad light on accuracy. For one thing, Wallace was never called Braveheart; that was Robert Bruce. But it did no harm to the legend, and Wallace’s memorial is a fine tower that stands on a hill just outside Stirling. 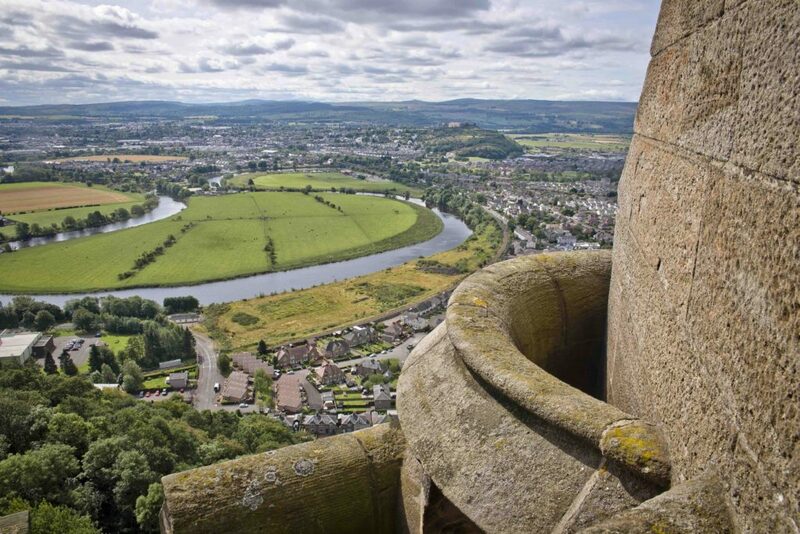 View of Stirling from the top of the Wallace Monument. VisitScotland / Kenny Lam, all rights reserved. For evening relaxation – and outstanding food – I found the unusual Hermanns Restaurant just opposite the Castle. Owned by Tirolean Hermann Aschaber, it combines the best of Scottish produce to the Austrian favourites of schnitzel and strudel. And do visit Henderson’s Bistro at the Albert Hall, a short walk from the Stirling Highland Hotel. It is part of the council run weddings and functions venue, the Albert Halls, and the food and service is outstanding. So think beyond Scotland’s usual suspects, like the cities of Edinburgh and Glasgow. 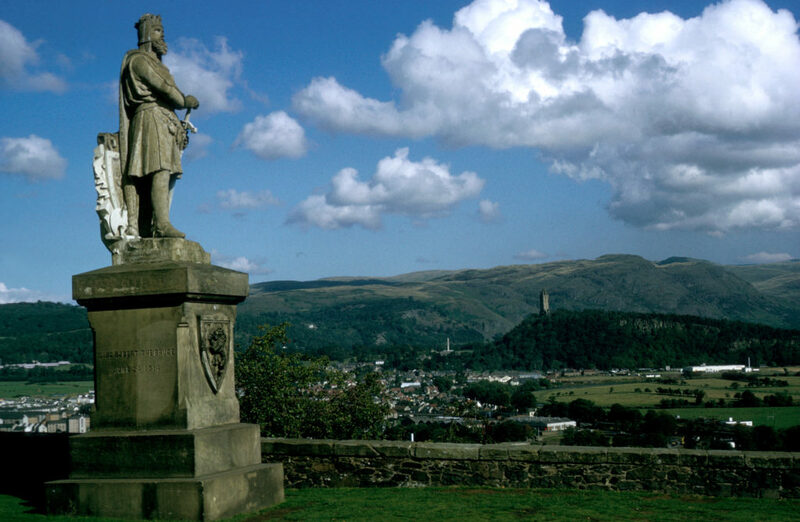 Stirling may be lesser known, but it’s a positive gem, full of history and charm. 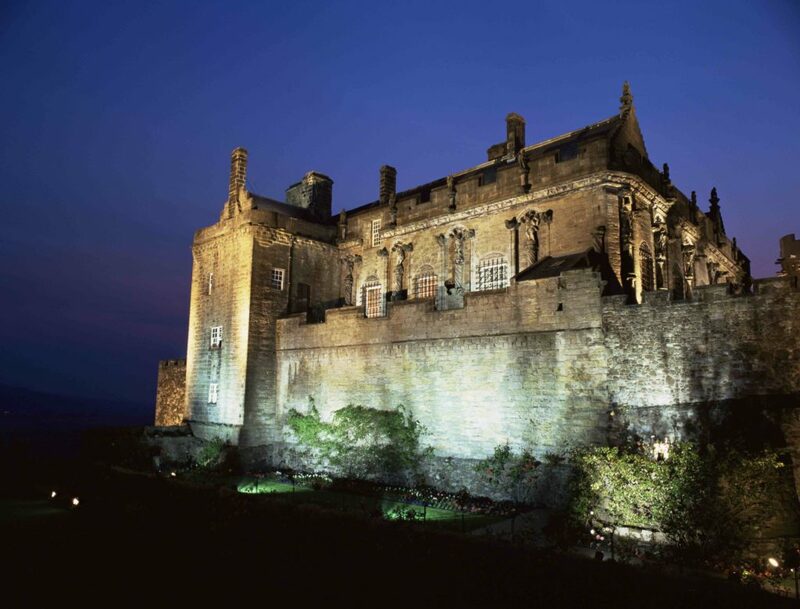 Stirling Castle at dusk. Courtesy VisitScotland / Paul Tomkins, all rights reserved. Getting there: Stirling is approximately an hour by train from Edinburgh Waverley station and about 30 miles from Edinburgh Airport.